All Criterion down sleeping bags come complete with a small stuff sack and a large mesh storage bag to help keep you bag stored when you are on a journey. Down sleeping bags are notorious for their ability to loft as soon as they are freed. This is great when you want to use them, but awkward when you are trying to return them to their stuff sack in the morning. If a stuff sack is too wide the sleeping bag will try to escape around the sides of your hand as you are trying to force it home. Sometimes it can give the impression of being alive and trying to get out ! 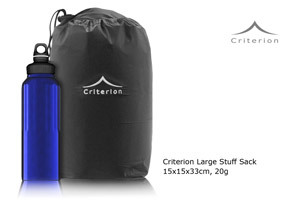 The Criterion stuff sack is specially designed for easy, one handed stuffing. 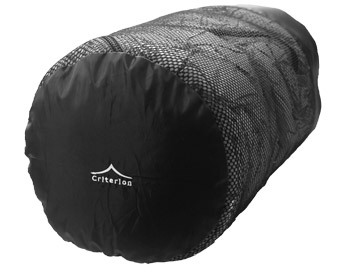 It has just the right diameter to enable the sleeping bag to be inserted one handed without it being able to “escape”. Finally, when it is all in and you want to withdraw your hand without letting the sleeping bag spring out, a ONE-HANDED pull on the draw cord is all that is necessary to close the neck and complete the job. That is due to having the drawcord toggle permenantly fixed to the side of the stuff sack. The Criterion stuff sack is SMALL. We have five different sizes depending on the sleeping bag model. The smallest is TINY – 11x11x25 cm and weighs just 14 gms. 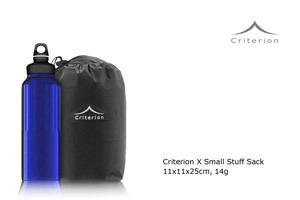 Even the largest is small compared with the competition – 17x17x36 cm with a weight of only 23 gms. 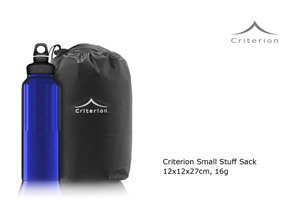 Despite being so light, the Criterion stuff sack is extremely durable. Made from ripstop Pertex material it has specially reinforced seams and will withstand many years of rough handling. Furthermore, a Pertex flap is incorporated at the neck of the stuff sack to close the stuff sack opening, giving added protection to your sleeping bag. 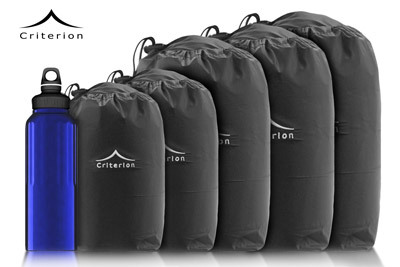 Whilst many of the features and attributes mentioned above also apply to the Criterion Expedition stuff sacks, there are significant differences resulting from the size of these sleeping bags and from the need to cater for their use in severe conditions. 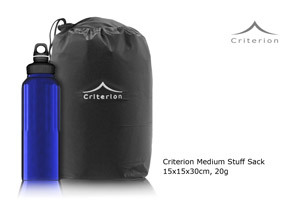 These stuff sacks are more substantial and more robust than those for the rest of the range, being made from a coated, high-tenacity polyamide fabric instead of Pertex. When not in use Down sleeping bags must NOT be left in their stuff sacks under compression. That will reduce their lofting ability. 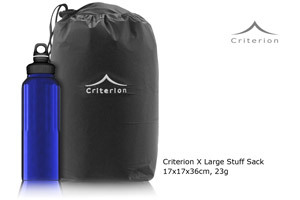 For storage, therefore, we supply a Criterion storage bag, free of charge, with each of our sleeping bags. This is made from a very breathable mesh fabric to keep your sleeping bag fresh and fluffy, thus ensuring many years of satisfactory use.